There has been a lot of talk about reducing the carbon emissions in Washington State and Seattle. But with all the good intentions and chatter, progress has been very slow. For example, the carbon emissions in Washington State was higher in 2013 than in 1990. There are similar statistics for King County and Seattle. Total emissions is not down at all... they are up. The essential fact is that the amount of carbon per person in the Northwest has declined slightly, but increasing population has more than neutralized the added efficiencies from better gas mileage cars and the like. And the situation is much worse worldwide, as global population increases and countries such as China and India use vast amounts of coal and fossil fuels to improve the living standards of their populations. 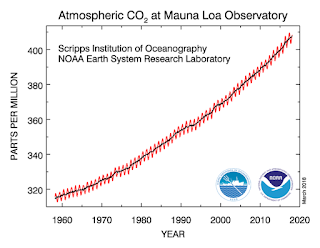 And, of course, there is the fracking revolution, resulting in increasing oil and gas production in the U.S. As a result, the amount of carbon in the atmosphere is rising rapidly...in fact accelerating upwards (see below). The earth is starting to warm as a result of increasing greenhouse gases and in order to make any real progress in reducing the warming, we would have to CUT the emissions by 80% or more during the next decade. Let's face it...this is not going to happen on our current course. 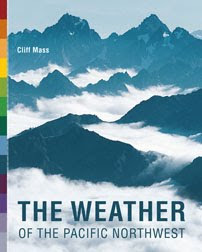 Catastrophic warnings and exaggeration of current climate variations by environmentalists (and local media outlets like, the Seattle Stranger and occasionally the Seattle Times) are doing little. Laying guilt trips on folks is clearly ineffective. It is obvious that few folks will really sacrifice voluntarily to reduce global warming, and the most rabid environmental types still take their airplane trips. The solution to this issue is elsewhere and inevitably technological. One approach is to plan for the warming and create a resilient society. Clearly a good move. The other is to develop effective technologies to use less energy and to develop clean energy sources. We must do this as well. And at the same time, natural gas is getting less expensive (see below). With cheap fuel costs, folks are increasingly buying bigger cars (SUV are all the rage), air travel remains affordable and increasing rapidly, and folks are still doing a lot of driving. The use of renewables is growing, but still represent only a few percent of the energy mix. (I always find it amusing that local environmentally oriented politicians never talk about the huge regional industry producing intensive fossil-fuel burning devices---Boeing). As long as energy is cheap and the costs of burning fossil fuels (air pollution, global warming) are not made part of the price, progress towards reducing its usage will be undermined. During the past few years there has been intense interest in using economic tools to restrain the growth of carbon emissions in Washington State and elsewhere, tools such as carbon taxes and caps on emissions, to name a few. In 2016, an initiative to initiate a revenue neutral carbon tax (I-732) was defeated. In 2017, Governor Inslee's cap on carbon emissions was found to be illegal, and last month, a carbon tax bill in the WA State Legislature (I-4849) was defeated. 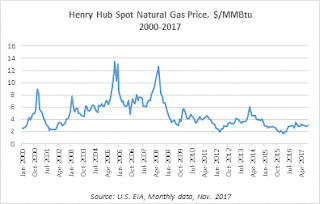 In this and my next blog, I will review these prior attempts to carbon reduction and discuss what I believe is the only viable route: a revenue-neutral carbon tax that put the funds back into the pockets of WA State residents. 1. 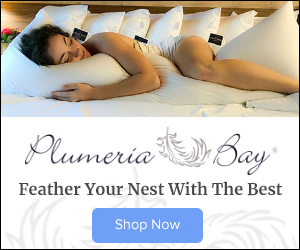 It is effective in significantly reducing carbon emissions. The penalty for using carbon should be large enough to provide a sufficient price signal to push folks to reduce their emissions and to encourage alternative technologies. 2. It is not regressive, with poorer people not paying more than their reasonable share. 3. It is simple, objective, and not in control of one political party or group. 4. It can serve as a model for the rest of the nation. A carbon tax that helps the situation ONLY in Washington State will not have much impact. We need a measure that could be used in other states and will encourage the development of technologies that can be used around the world. It must be a bipartisan, since our nation is split between two parties. There are two main types of carbon taxes: (1) revenue-neutral taxes that return all the carbon taxes to citizens and (2) carbon taxes that use funds for a variety of purposes, such as making investments in alternative energy technologies or for more general "social justice" goals. Another approach is to dictate carbon reductions through "caps" on carbon emission. Some caps simply limit carbon emissions with no money changing hands (like Governor Inslee's executive action that was found unconstitutional) or ones where organizations can trade and sell rights to emit carbon, with money changing hands (cap and trade). But the cap approach has run into problems in both Europe and California, and has inherent weaknesses that allow such an approached to be "gamed." 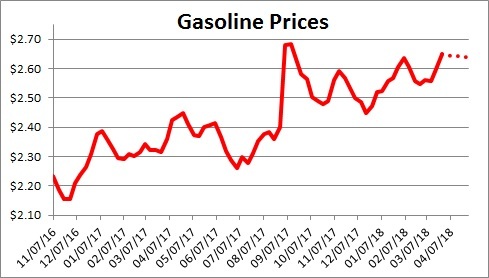 In my next blog, I will examine past and current attempts at a carbon tax in Washington State and make the case for a revenue-neutral approach. Why do we care about this? A Neutral winter can be exciting here in the Northwest, with the strongest storms (floods, winds, snow) preferring Neutral conditions. 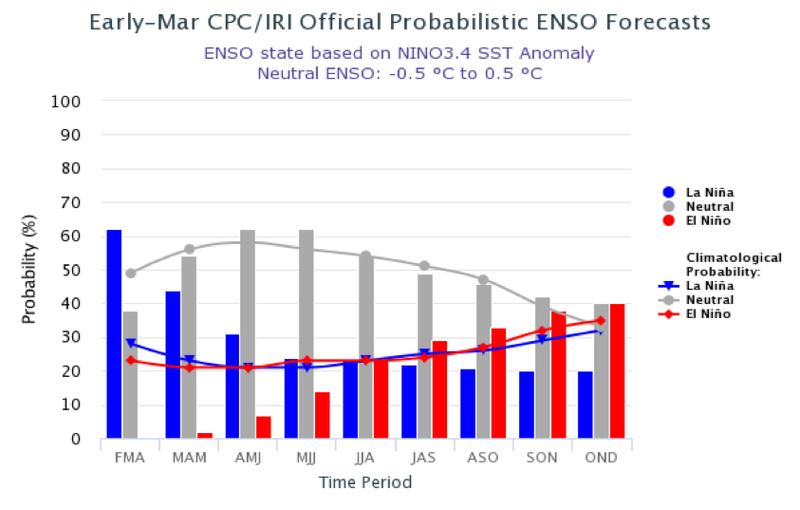 But before we get too excited, let's wait until July when our ability to predict the state of the tropical Pacific next winter will be far more skillful. During the past day or two there have been moderately strong southerly winds over the central and southern Sound. We have been cloudy, but with very little rain. In fact, this is some of most cloudy weather and the lowest solar radiation we have ever experienced in March when it was not raining. In contrast, winds on the coast have been westerly and its been much wetter there, as has been the case in the Cascades. What is going on? The answer: A profound rain shadow over Puget Sound, and what I call rain shadow winds. A new term to add to the western Washington weather lexicon. 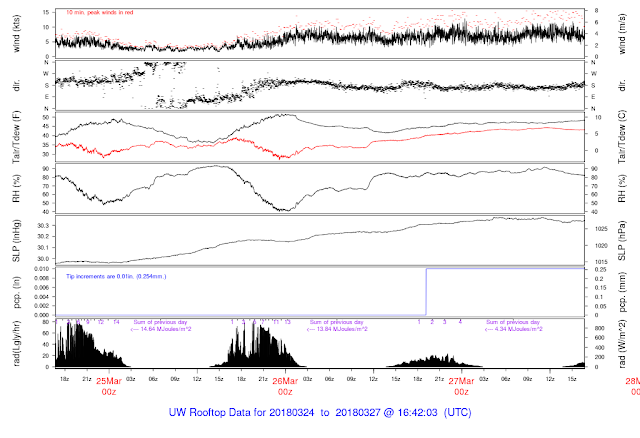 The winds aloft along the coast have been persistently from the west (westerly) to southwest in the lower atmosphere, something indicated by the radiosonde soundings at Quillayute on the Washington coast. A sounding at 5 PM yesterday shows this (below). The wind barbs are in blue and heights are in terms of pressure 850 is about 5000 ft. The winds were westerly at 10,000 ft (700) and southwesterly below. With westerly and southwesterly flow in the lower atmosphere, the air rose on the western sides of the Olympics and coastal mountains, producing precipitation. But then it sank over the eastern side, producing warming and a rain shadow over central and western Puget Sound. And then it rose again on the western side of the Cascades producing more precipitation. The NOAA precipitation total for the 24h ending 5 AM this morning shows this precipitation pattern. And the sinking air and rain shadow were even evident in the visible satellite imagery this morning (see below). Small rain/cloud shadow to the east of the Olympics, big one to the east of the Cascades. How does this all explain the relatively steady southerly winds from roughly Lynnwood to the south Sound? With strong southwesterly/westerly flow approaching the Olympics, there was substantial sinking on the eastern and northeast sides of the barrier. Such sinking causes warming by compression and warm air is less dense than cold air. Less dense air results in lower pressure to the lee of the barrier. 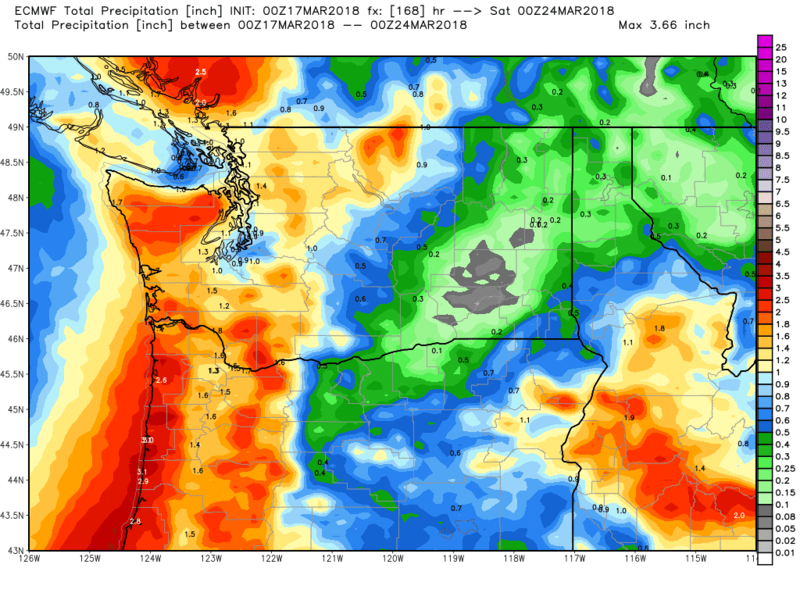 A forecast of sea level pressure (solid lines) and winds from the WRF model, valid 2AM this morning shows this pattern--with a lee low or trough of low pressure east of the Olympics. South and southeast of the low there is a relatively strong north-south pressure gradient because of the lee low, and that difference in pressure drove moderate southerly winds. The bottom line: there is a direct connection between the rain shadow and the strong southerly winds, with both forced by sinking on the lee (eastern) side of the Olympics. The NW Weather Workshop is the main annual meeting for those interested in Northwest meteorology. This year we will have a major session on the meteorology of NW wildfires and others on other aspects of our regional weather. The gathering takes place at the NOAA facility in Seattle. To view the agenda and to register, go to the meeting website. The workshop is open to everyone, but registration is required. During the past few days I have received nearly a half-dozen emails with pictures and videos of beautiful tendrils of precipitation falling out of convective clouds, so this is a good time to show you some and talk about this stunning weather feature. To warm you up, here is an amazing example, one visible from the Seattle Space Needle Panocam at 7 PM Saturday evening. A lone cumulus tower developed over NE Seattle in the minutes before and if you watch a time lapse you could see the precipitation fall out of the cloud. It didn't hurt that this was around sunset. Since I am an academic, let's start with some definitions regarding the phenomenon in question. "an observable streak or shaft of precipitation falling from a cloud that evaporates or sublimates before reaching the ground." So technically, the precipitation (liquid or solid, rain or snow) should evaporate before reaching the surface if it is virga. If it does not evaporate before hitting the ground we use another term: precipitation shaft. But basically, they are the same thing. So in the pictures above, we have a mixture of the two at the same time. Now it turns out we had a photographer just to the west of the same virga/precipitation shaft. Her is a wonderful shot by Kathy Scott at 7 PM from her vantage point in Maple Leaf in North Seattle. Clearly the precipitation shaft is to the east of her (you can see the Cascades in the background). Virga is usually associated with evaporative cooling, as precipitation falls into air that is unsaturated (less than 100% relative humidity) below. If you are below a cloud that starts to precipitate...and thus producing virga... you might well feel a blast of cooler air because the precipitation had evaporated before it reached the surface where you are. And because cool air is denser and thus heavier than warmer air, the evaporating air tends to accelerate downward. And when the downward moving air slams into the surface it splays out, producing enhanced horizontal winds. Did that happen last night? You bet. Let's pick a location west of Maple Leaf (see map below) from the stations available from the wonderful weatherunderground.com site. Here are the observations at the location (click on the image to expand). If you look closely in the first panel you will see a sudden drop in temperature and a rise in dew point (a measure of the amount of moisture in the air) around 7 PM. In the second panel there is wind speed....a notable acceleration was observed. The fourth panel should an abrupt change in wind direction from the cool, downdraft air. But there was no accumulation of precipitation (third panel)...it has evaporated. Interestingly, I live close to the above station and I experienced some very, very light showers at that exact time. I know that because I trying to repair my old wheelbarrow at that time. And a chill developed in the air. Finally, if you really want to experience virga, one has to view an animation. So here is a wonderful example provided by Greg Johnson of SkunkBay Weather for a convective line that moved through his north Kitsap location of Wednesday. Enjoy. Squall Moving Through... From The Air and Ground.... 3/25/18 from SkunkBayWeather on Vimeo. Unusually cold air has moved over the northeast Pacific and the Pacific Northwest, creating unstable conditions and snow descending to the higher hills. During the past hour (10 AM), snow was reported at Paine Field in Everett (604 ft) and at Sea-Tac Airport (452 ft). At Peter Benda's house in Bellevue (1300 ft), snow was accumulating in a winter-like scene. Using the capabilities of the City of Seattle's SNOWWATCH app, we can see that the freezing level this morning has dropped to about 1300 ft (see plot of temperatures above SEA-TAC airport below), which means the snow level would be roughly 300 ft (below that level there would be only rain). Cold air has moved in aloft, associated with an upper-level low pressure center that is centered west of Vancouver Island (see 500 hPa--around 18,000 ft-- weather map below for 5 AM Friday morning). Here is a temperature map at roughly 10,000 ft (700 hPa)--you can see the cold air aloft (purple colors) associated with the low. With cold air aloft and warming temperatures at the surface (it IS late March), there is a very large change of temperature with height and that promotes instability: having the lower atmosphere break up into upward moving thermals and sinking air around them. Just like in your hot cereal pot when you turn on the burner. Upward motion results in cumulus, cumulus congestus, and cumulonimbus clouds, resulting in intermittent heavy showers. Maybe some soft hail or graupel if you are lucky. You can see the instability in the visible satellite image this morning. The small elements are the anvils from convective clouds. Perhaps a more impressive view is from the infrared satellite image (the shading shows the temperature of the cloud tops, with white being the highest). Cold, deep convection over and off our coast. The problem for lowland snow lovers is that low-level air is coming off the warm ocean (which is about 50F), making it too warm for snow, and particularly accumulating snow, to reach sea level. The threat of light lowland snow over the hills is not over yet. Tomorrow morning, the upper level low and its surface reflection will approach and move south of us (see surface weather map at 8AM Saturday), with cool air over western Washington. Very weak onshore flow. There will be enough upward motion to promote some showers of snow and rain. The latest UW WRF model run shows some light snow getting close to sea level for the 24h ending 5 PM Saturday. Enjoy the snowflakes...this could be your last view of them until next winter. By late March, the threat of lowland snow is normally over, temperatures are warming, and one starts thinking of gardening and hiking. But during the next few days our relatively normal temperatures of the past week will cool substantially and some portions of lowland Washington and Oregon may get some light snow. The reason? A deep upper-level trough moving southward into the eastern Pacific. The current (5 AM Wed) upper level map at around 30,000 ft (see below, with wind speeds shown by color and wind parallel to the height lines) already shows substantially troughing (lower pressures or heights) over the eastern Pacific, with a jet stream (stronger winds, yellow colors) well south of the Northwest. 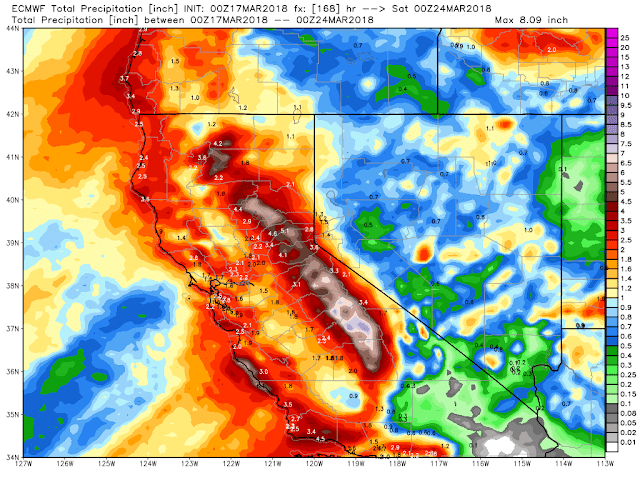 Strong southwesterly flow will bring a lot of moisture into California and large amounts of precipitation there. The jet stream is associated with a large horizontal temperature contrast (cold north, warm south of it), and thus we are on the cold side. But the situation is about to get more exciting for us as the low to our north greatly amplifies and moves southward (see the same map for 11 AM Friday below). The jet stream (yellow areas) will still be south of western Washington and Oregon and northern California will remain wet. Now lets turn to a surface chart (sea level pressure, 3000 ft temperatures--colors, and surface winds). The cold blue temperatures show a lower atmosphere that is cold enough for snow to fall below roughly 1000 ft. The problem for getting snow at sea level with such a pattern is that the flow is onshore (the ocean is a WARM 50F). So what do the model snow forecasts show? Here is the 24 total snowfall (not accumulation) ending 5 AM Friday. Some very light snow (flurries) near sea level and maybe an inch or so on the Kitsap where upslope flow will produce greater intensities (which helps bring snow to the surface). Plenty of snow in the mountains and particularly the Olympics. The next 24hrs? Snow in the mountains extending down to roughly 1000 ft. Looking at the total over the next 72 hours will bring smile to all skiers, snow-shoers and thus enjoying winter recreation. Our regional mountains, already with an above-normal snowpack, will get a substantial hit of new snow (1-2 feet at higher elevations). Northeast Washington gets more snow. 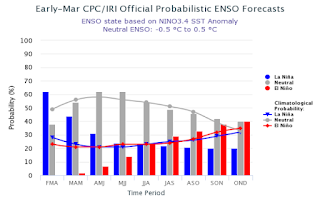 The bottom line: we are now guaranteed of going into the summer with a very healthy snowpack. And with our reservoirs in excellent shape, water supplies for the population and agriculture are secure. 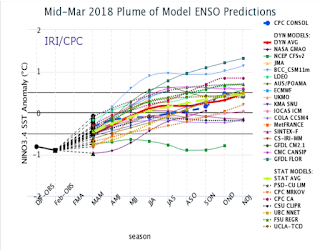 Such a strong end to the season is typical of La Nina years, and this one is not disappointing. In June, four women plan on rowing from California to Hawaii to highlight their concerns about global warming and the degradation of the world's oceans. We are talking about journey 2400 miles on human power alone, and they are planning on doing this in less than 50 days, thus breaking the record for a women-only team to cover this huge distance. One of the women is an undergraduate in my department, Eliza Dawson, an excellent student who plans of going to graduate school next year to study the earth's climate system. 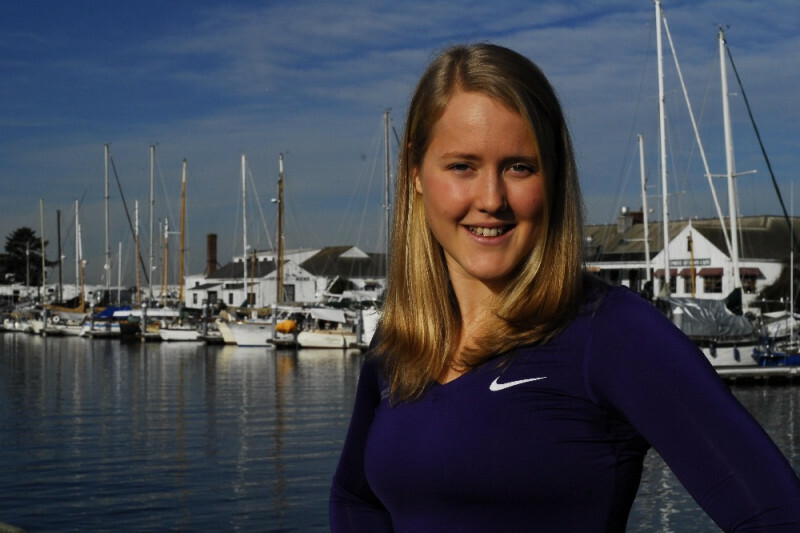 Eliza is also a member of the UW's fabled women's crew team, and thus is an accomplished athlete as well. Such an effort is not inexpensive and thus she is raising funds to support this effort (here and here). I am intrigued by this ambitious project on many levels. Eliza and compatriots will view and document the current state of the northeast Pacific at close hand. 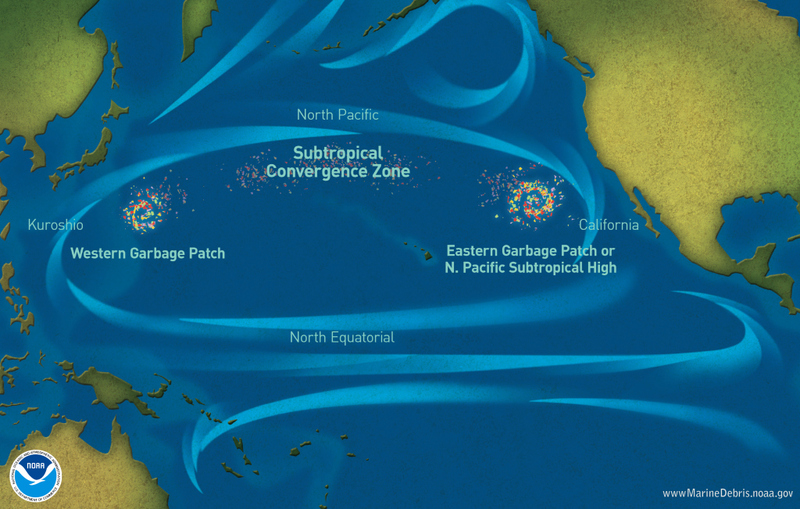 As many of you know the world's oceans have become a giant junk yard, particularly for floating plastic, and they will go through one of the worst garbage collection areas--the center of the east Pacific gyre (see images). They plan on taking pictures and documenting the debris they pass through. They are also concerned about the impacts of climate change on the oceans and the planet, and Eliza plans on documenting the ocean surface temperatures and other characteristics as they row from the mainland to Hawaii. I am also fascinated by the anthropological implications of the passage of humans from the mainland to the islands without the benefit of motorized transport. Could ancient Hawaiians have visited North America and vice versa? Eliza and friends will have a harder trip than native Americans, since they are not using sails, which would be quite useful for the route they are taking. And I am intrigued of the athleticism of this challenge....making this journey using the power of their arms. 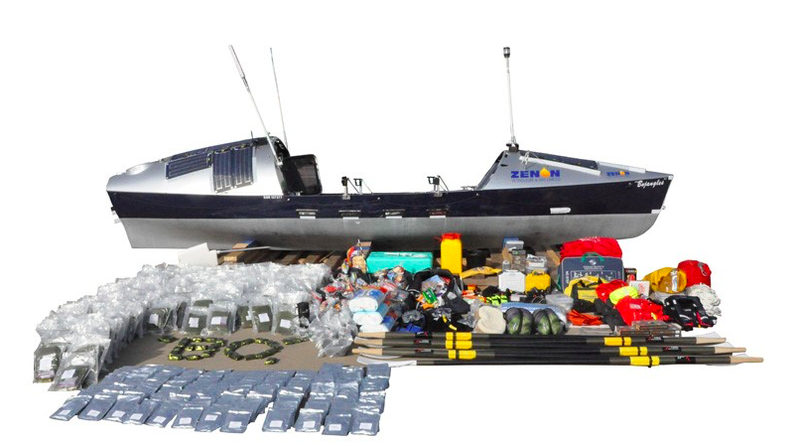 Imagine, a month and half of rowing, 2 hours on and 2 hours off. Imagining this is as close as I am going to get to doing it. In order to participate in this effort, Eliza will have to raise about $20k during the next few months. So far she has raised several thousand dollars and is turning to crowdfunding to secure the remainder. If you would like to assist her, please go to her fundraising web site. I will certainly do so. Finally, take a look at a video they produced about their upcoming trip. 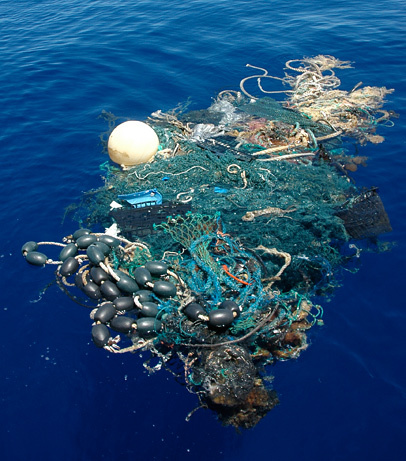 Dealing with anthropogenic climate change and learning to live with our planet in a more sustainable way are two of the great challenges of our species. It is very encouraging to see a future young scientist willing to make such a tremendous exertion to bring attention to these important issues. Some call it the "March Miracle"--the large amounts of precipitation and snow that fallen over California the past month. The Sierra Nevada got hit by 2-5 feet this week alone. And this is a miracle that is not over, with a strong atmospheric river poised to occur over the next week. Here are snow water equivalent maps (amount of water in the snowpack) from the National Snow Analysis for February 17 and March 17. A huge increase in both depth and coverage. 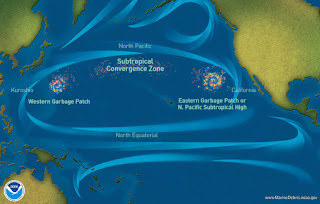 The origin of the wet bounty over California was a shift in the large scale atmospheric circulation, with high pressure moving further offshore and persistent troughing (low pressure) developing over the West Coast. To illustrate, here is mean upper level (500 hPa, about 18,000 ft) heights for March 10-16th. The left shows the heights (analogous to pressure) and the right shows the deviation (or anomaly) from normal. A trough (low heights) is found right off the West Coast...that is culprit. 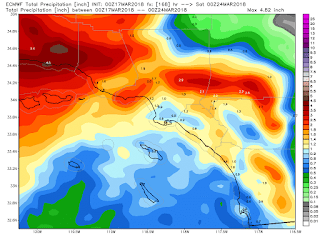 How much precipitation will those folks in California enjoy? 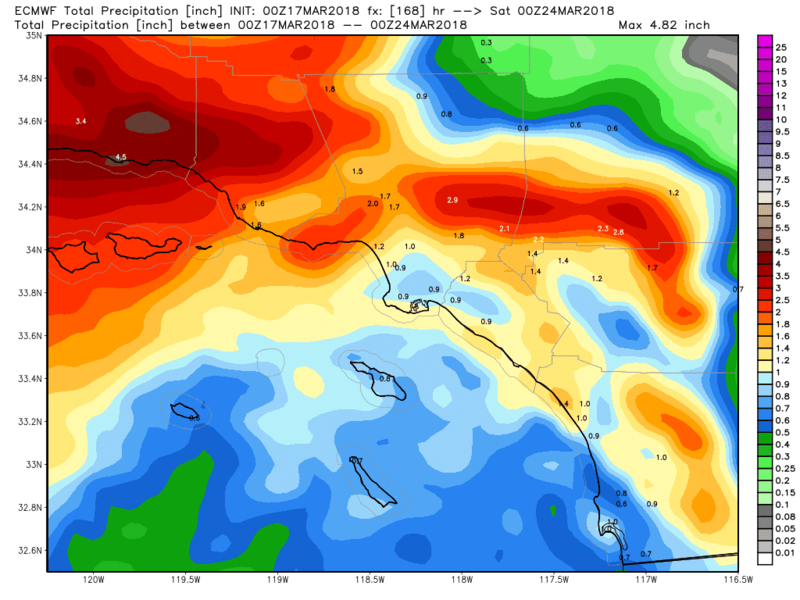 Here is the forecast accumulated precipitation over California for the next 7 days from the European Center Model: up to 6-8 inches in the Sierra Nevada and coastal mountains. And plenty around southern CA, such as the mountains that surround LA. 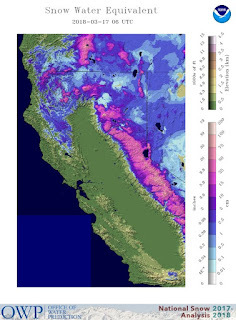 With all the recent snow, the Sierra Nevada snowpack is about 60% of normal. It will get much closer to normal after the next few weeks. And the reservoirs, already around 100% of normal, will get topped off for the upcoming dry summer. The only negative of all this precipitation is that it will encourage the growth of grasses, which can enhance the potential for fire danger next fall after it has dried out. Here in the Northwest, our situation will be far less exciting than for California, with much of the big action going south of us. The 7-day totals show the heaviest precipitation over western Oregon but only light precipitation over the Puget Sound area and the San Juans. Is the Western U.S. Snowpack Declining "Dramatically"? Last week a paper (Mote et al., 2018) was published in the journal Climate and Atmospheric Science claiming "dramatic" declines in western U.S snowpack (you can access it here). The article had all kinds of scary details. The loss in water resources would be "comparable in volume to the West’s largest man-made reservoir, Lake Mead" and the losses would be so great that "new reservoirs cannot be built fast enough to offset the loss of snow storage." 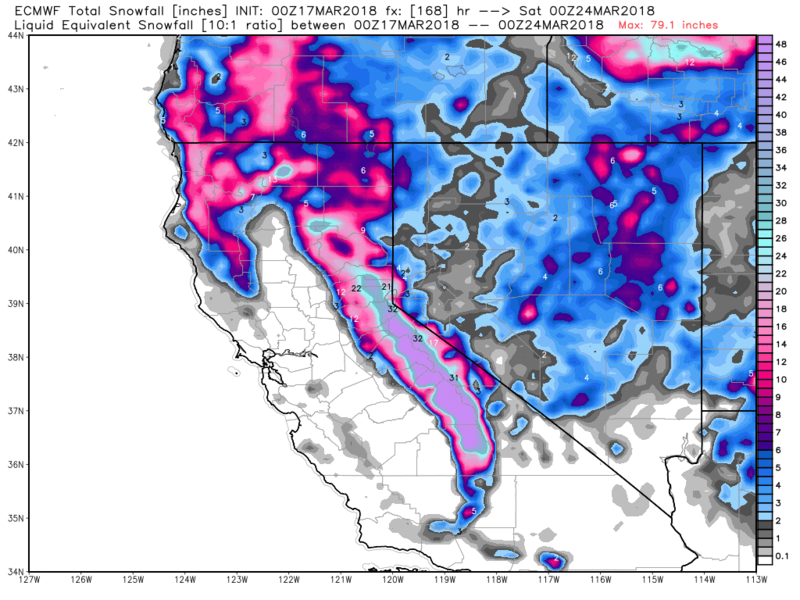 The media headlined this "dramatic" loss of western snowpack, with hundreds of stories in major outlets around the world, allowing millions of people to learn about the bad news. Here are a few examples. I could show you a hundred more, but you get the point. But fortunately, the "dramatic" headlines and all the hype are not correct. 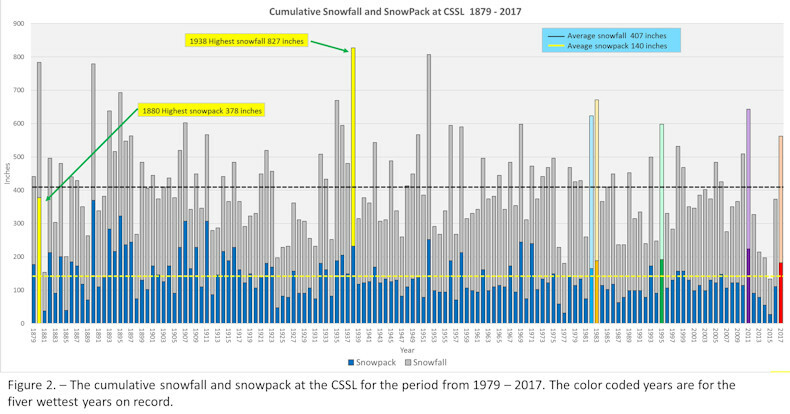 There has been no "dramatic" loss of western snowpack during the past century, but rather a relatively slow, steady decline. And as I will demonstrate, the scary paper's own research supports a less apocalyptic interpretation. As does other research in the peer-reviewed literature. Since we are not talking about a thespian document, definition (2) is the one we want: an event or circumstance that is sudden and striking. Has the trend of snowpack over the western U.S. during the past decades been sudden and striking? The answer to this question is really important. 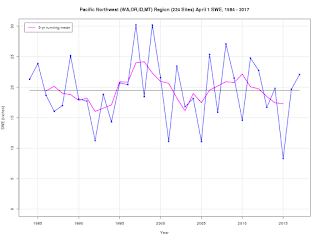 Many politicians and activist organizations are claiming that we have experienced a rapid decline in western snowpack driven by global warming. And an accurate knowledge of snowpack changes is clearly important for making decisions about water resources. And what about the future of western U.S. snowpack? The Mote et al. paper uses two approaches to evaluate past snowpack changes over the western U.S. 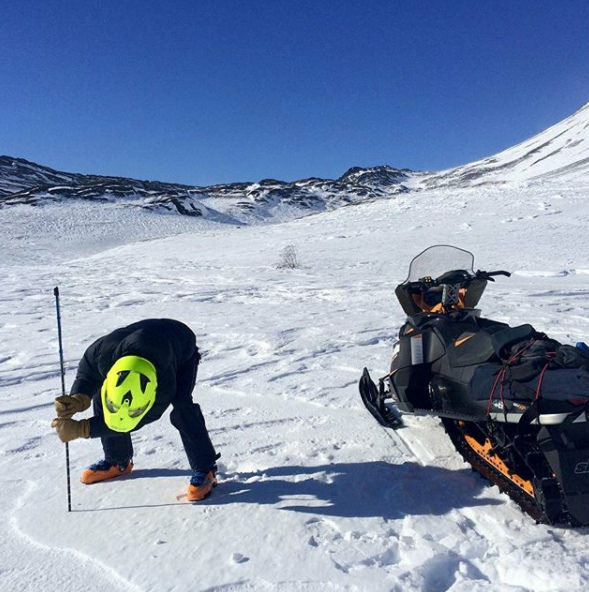 The first is to examine snowpack changes based on direct measurements. The problem with that approach is that there are only a limited number of stations and the number and distribution of such stations have changed considerably over time. The second makes use of a snow/hydrology simulation model called VIC (Variable Infiltration Capacity) model, developed by Professor Dennis Lettenmaier of UCLA (and formerly the UW). 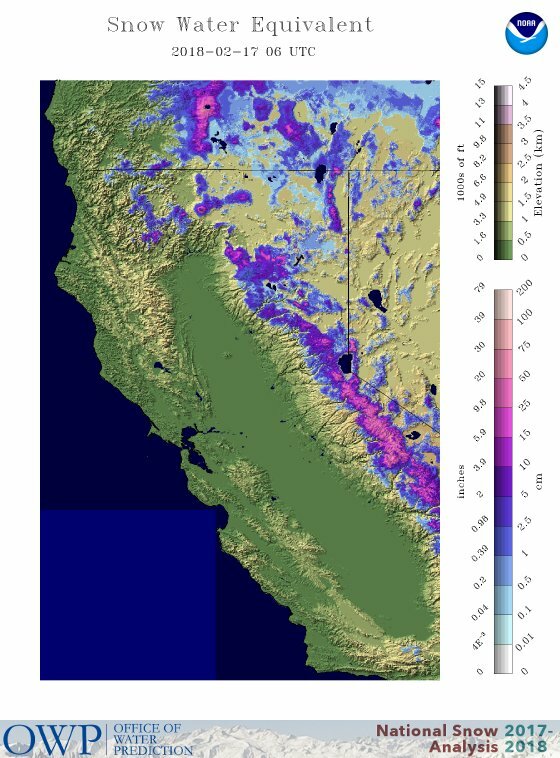 This model uses precipitation and temperature inputs (there is a LOT more of these than snowpack measurements) to simulate the changing snowpack. 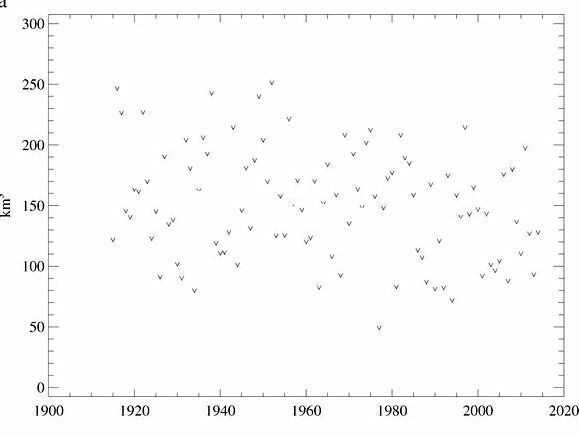 Below is a figure from the Mote et al paper showing the snowpack (actually the snow-water-equivalent or SWE) over the western U.S. on April 1 each year from 1915 to 2014 using the VIC model approach. 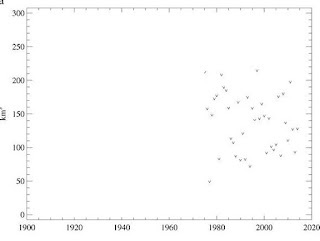 They also fitted a line to the variation over time. You will note that there is huge amount of variability year to year, with an apparent slow decline in snowpack over the past century. Specifically, they found a 21% decline over the past century or 2.1% decline per decade. Hardly seems dramatic. I should note that April 1 snowpack is a frequently used measure, since in the west snowpack generally peaks around then, and thus April 1 snowpack is a good measure of the water availability for the upcoming warm season. Now imagine their line was not there. In fact, you don't have to imagine, I have done it for you! There doesn't seem to be any decline during the past few decades...if anything, the snowpack seems to be increasing. 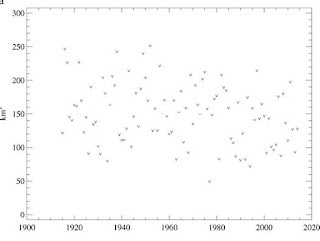 In fact, here is the same figure, with only the last 40 years shown. No decline, dramatic or otherwise is apparent. Where did that headline come from? 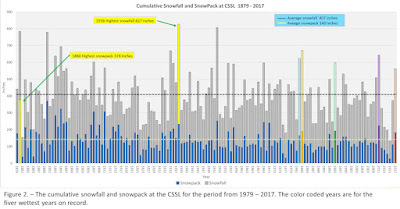 Now a completely independent analysis of long-term snowpack trends over the Northwest U.S. is found in a peer-reviewed paper in the Journal of Climate (A New Look at Snowpack Trends in the Cascade Mountains by Stoelinga et al...found here). They used a statistical approach to secure the snowpack from temperature, precipitation, and streamflow instead of the physical model (VIC) mentioned above. But the same general idea. Their results for 1930 to 2007 are quite similar to those found in the Mote et al (2018) paper, with a 23% decline for the entire period, and increasing snowpack since 1975. I repeat, increasing. 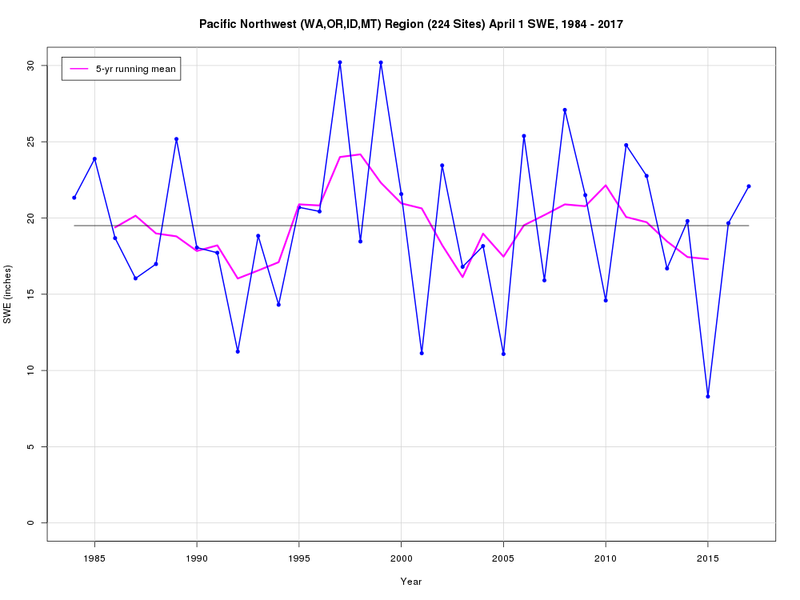 Furthermore, they went one step further and tried to remove natural variability (like the Pacific Decadal Oscillation) and got the April 1 snowpack trend shown below. Plenty of variability and a very slow decline (16% over the period). About a 2% decline per decade...similar to the Mote et al. VIC results. Nothing large, nothing sudden, nothing dramatic. 2% loss per decade. No acceleration of snowpack loss. And as I will explain late, this make perfect sense considering that the Pacific Ocean is just west of us. But what about snowpack observations over the West? As noted by Mote et al., there is a major problem using such observations: the number of measurement sites is small and their numbers and distributions have changes substantially over the past 50 years. To illustrate, here is a figure from the supplementary material from the Mote et al paper, showing changes in the number of observations for various subregions. Few observations before 1940 and a major increase in the 60s and 70s. The numbers have been relatively stable since roughly 1975-1980. 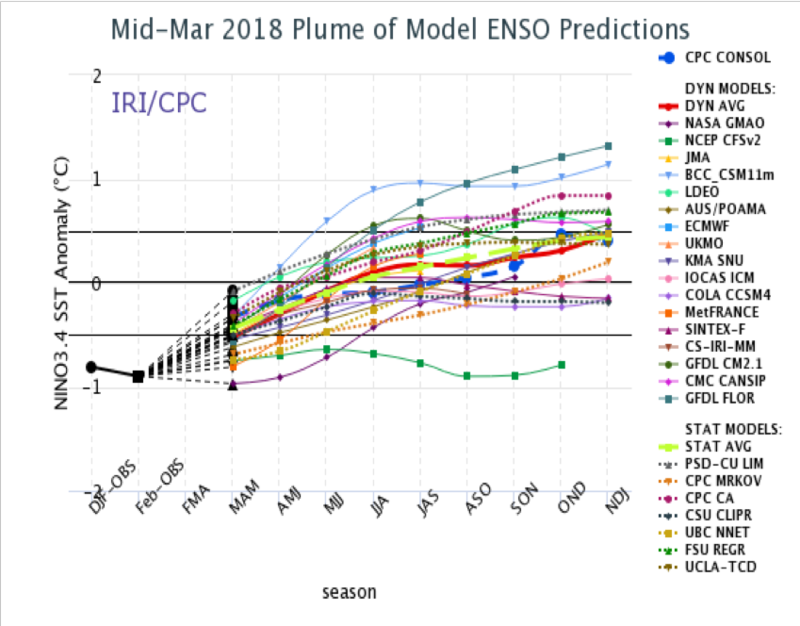 With those issues noted, below is a plot from Mote et al of the observed April 1 snowpack for three western regions: the Cascades, the Rockies, and California. The circles are the average snowpack for each region (ignore the red xs and red line...that is for the VIC model which we already covered). I removed a blue trend line from these figures--I want you to make your own appraisal of the trends. 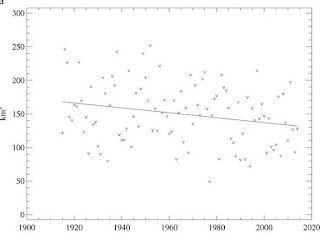 Specifically, look at the period since 1980, when the observational network as relatively stable. It is clear that there is little April 1 snowpack trend in the observations for the last 35 years. Yes, 2015 has a very poor snowpack...but that was an isolated outlier....for climate studies we must look at the trend...and there simply has not been much of trend. Just a lot of variability. 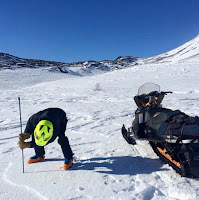 As an independent check on the observed trend in April 1 snowpack, research meteorologist Mark Albright, past WA state climatologist, did his own analysis of the April 1 snowpack changes over Oregon, Washington, Idaho, and Montana using the USDA Snotel observing stations. He considered the period 1984-2017, since the SNOTEL network expanded into the early 1980s. A seen below, there is virtually no trend over that period (and I might note that 2018 looks like an above-normal year). Now to beat a dead horse, here is one more observed record of mountain snowpack, one encompassing a very long period (1879-2017): the snowpack at Donner Summit, high in the Sierra Nevada (this is from the Central Sierra Nevada site associated with the University of California, Berkeley). 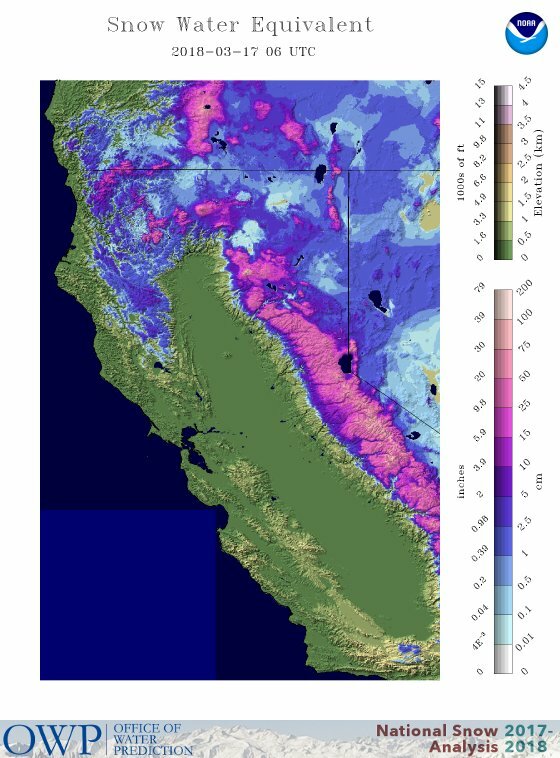 The color bars are April 1 snowpack). More snowpack in the late 1800s, but only a slightly downtrend during the past several decades. Now you might ask, why has western snowpack been so stable if the earth is warming? A very good question. A major part of the answer is that the eastern Pacific has NOT warmed very much and our temperatures are substantially controlled by the eastern Pacific surface temperatures. To illustrate the lack of warming, here are the surface air temperatures from the NASA/GISS website, showing the trends from 1977-2015. 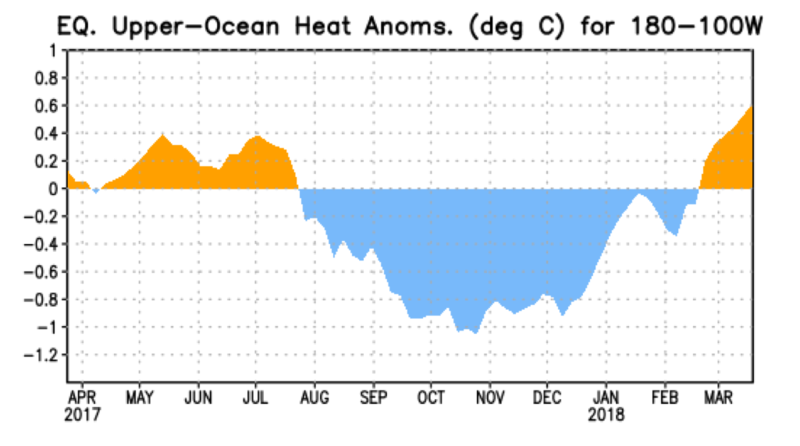 The eastern Pacific actually cooled during that period. 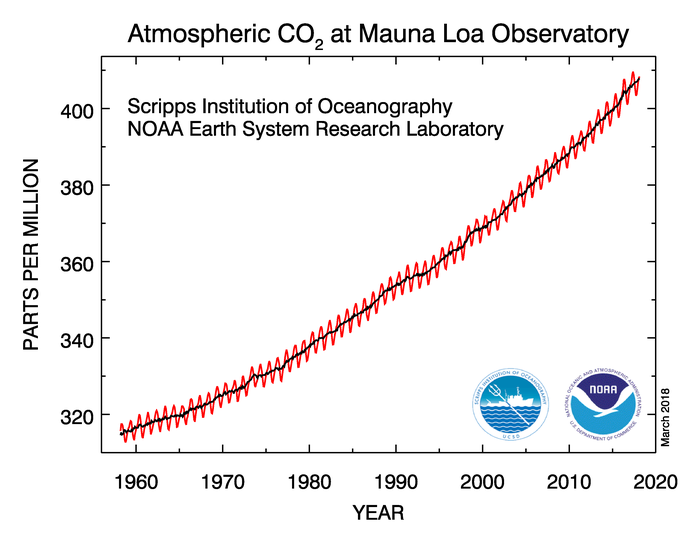 This pattern is similar to that indicated in climate models driven by increasing CO2. The Arctic warms up more than anywhere, land warms more quickly than oceans, and eastern oceans generally warm the slowest. I know that some of you are unhappy with the above analysis, even though the evidence is pretty compelling that the snowpack has not been dramatically reduced the past few decades. You have heard the constant drumbeat from the media, some activist groups, and a few scientists who should know better. But before some start calling me names (e.g., climate contrarian or denier) or the Seattle Stranger does another hit piece, or someone complains to my Dean, let me explain that global warming will have major impacts on snowpack during future decades and especially after 2050. Increasing CO2 will cause increasing warming during the upcoming century that will reduce snowpack substantially. Some regional climate runs that my group and Professor Eric Salathe completed a few years ago, show major snowpack reductions (see graphic). But the loss of snowpack during the snowpack has been modest and slow, and certainly not dramatic. And the fact that it has been going on for over a century suggests that part of it is probably natural and not driven by anthropogenically driven increases in greenhouse gases such as CO2. The planet experienced a cool period (the Little Ice Age) from the 1600s to the late 1800s, that produced more snow over our region. With the end of the cool period (probably due to natural causes), snowpack has slowly declined. Scary headlines and claims of dramatic snowpack loss are counterproductive in many ways. They are clearly not true and thus undermine the credibility of those claiming such losses (activist scientists, politicians, and advocacy organizations). They can result in poor public policy and infrastructure planning. They unnecessarily scare people and make them anxious, an increasing problem (two days ago the Seattle Times had a front page article about a UW Bothell class dealing with dealing with anxiety about climate change). And then there is the moral/ethical dimension. Scientists and the media must communicate our best understanding of the truth faithfully and not exaggerate/hype to get people to "do the right thing." As I have learned personally, there is a real cost to telling "inconvenient truths", but society can only make wise decisions if it is provided with unvarnished information based on the best science, and including information about uncertainty. Another issue regards the press releases of universities and other research institutions. There is a tendency to go for dramatic headlines and hype to secure the "currency of the realm" for PR people--lots of clicks and attention. But the contents of the research papers are often distorted in the process. This was clearly an issue for the Oregon State University press release regarding the Mote et al paper, and it occurs all the time here at the University of Washington and at other instituions. Finally, the spread of such hyped material says something about the current state of online and print media. Apparently, few "reporters" bothered to read the paper they were headlining. Few completed a reality check on the claims. But they were attracted to the big "dramatic" headline and were happy put out the excessive claims as a way of getting attention and "clicks." This is more than an inconvenient truth, but is a challenge for our democracy, since a misinformed public will not make good decisions.